No input buffer and dual output buffer (to run the system in stereo) with an isolation transformer on the RIGHT output with a polarity switch. 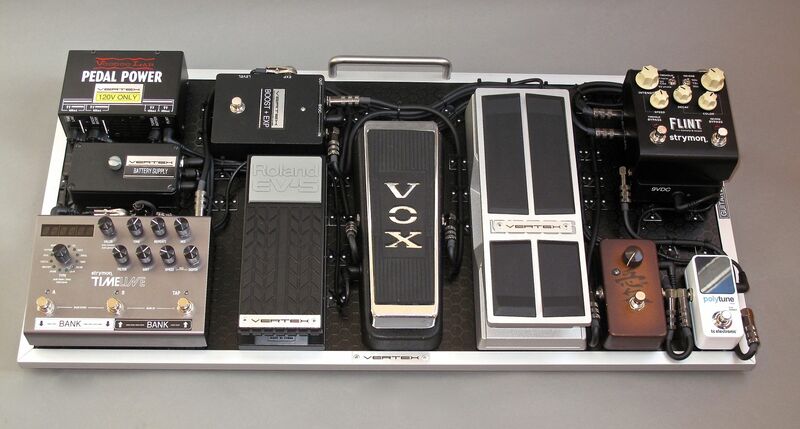 Vertex R/A and Straight 1/4"
The battery pack holds two 9V batteries that are only active when the entire pedalboard is powered ON from the Voodoo Lab power supply so the batteries aren't drained. There is an internal relay in the battery pack that turns the batteries on and off when the power is connected or disconnected. INTERFACE (passive), T.C. 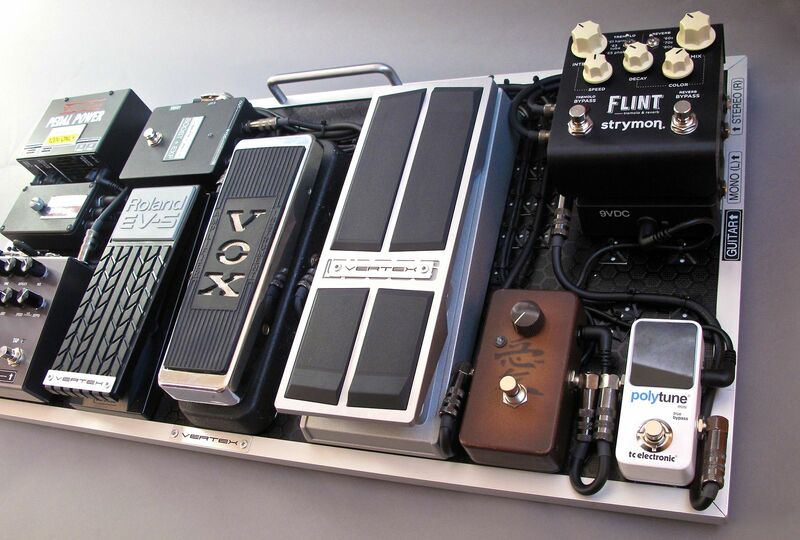 Polytune Mini, Lovepedal COT Lil' China, Vertex Custom Boost/EXP with Vertex modified EXP, Vox Wah (with Vertex Axis Wah PCB), Strymon Timeline w/EXP (stereo out), Strymon Flint (stereo out), INTERFACE (dual output buffers for L and R output and isolation transformer on the R output with polarity switch). 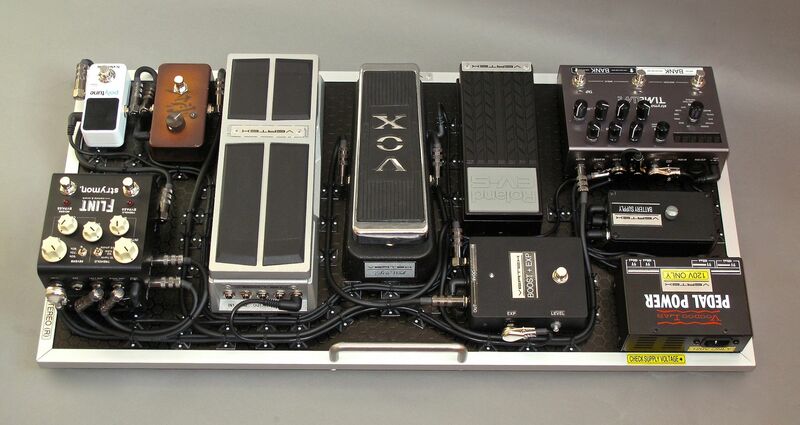 * Vertex Boost/EXP is a boost pedal with an expression pedal to control the amount of boost desired. In the heel-down position the volume is completely off (as a volume pedal would be in the heel-down position) and in the toe-down position the level is determined my where the trim pot is set on the side of the pedal (anywhere from unity to +15dB). 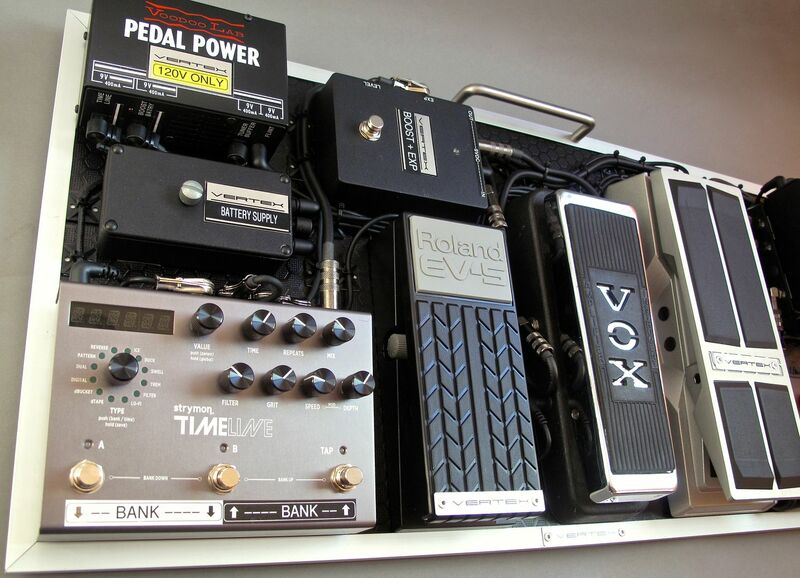 * Vertex Modified EXP (Boss FV500L) is a modified EXP/Volume pedal with a custom taper to better match the Vertex Boost. * Vertex Modified EXP (Roland RV-5) is modified to improve the mechanics of the unit and disconnect the pot on the side (Robben is not using this function and found it unnecessary for the Timeline). The pedal is only used to control mix.